This week the Critter Challenge Blog has another great Challenge Sketch, and a surprise sponsor! Stamp and Create will be giving away a $15 GC to one random winner who plays in this weeks Critter Sketch Challenge. If you played in last weeks challenge, and play again this week, you're name will be entered twice into the random drawing! This weeks Sketch also requires you to use a minimum of 2 eyelets or brads somewhere on your card. Remember you can use any vendors stamps when working with the Critter Challenge, after creating your card, be sure to leave your link on the Cirtter Challenge Blog using Mr. Linky. I rotated the sketch, and replaced the star with a rectangle. I used the Easter Blessings stamp from Wags N' Whiskers, stamped in Black Archival on Watercolor paper, then colored using the Marker Watercoloring Technique. 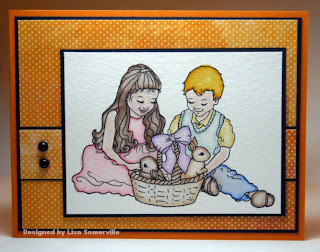 Very sweet, I love the little boy and girl and of course the basket of bunnies. Great coloring. Fantastic card, and what a sweet image! So beautiful, thank you for playing with us on your off week. Love it!! very cute card Lisa, the image is darling and I love the matted paper in the back with the layers. Lisa, this is gorgeous. The images is wonderful.